Archibald McIlroy was born in 1859 in Fluther's Loanin in the townland of Ballylinney, where his father was a small farmer. After National School, he went to Belfast to study at the Mercantile Academy and the Royal Belfast Academical Institution, Although he considered training for the Presbyterian ministry, he instead entered the Ulster Bank, where he worked as a clerk for ten years. He then went into business on his own account, and, married to a clergyman's daughter, settled in Drumbo, Co Down. He became a JP, and a member of Down County Council, a position that gave him the chance to promote the cause of land reform, a contentious issue in late-Victorian Ireland. McIlroy's young son gave a start to his writing career, when he repeatedly asked his father for stories. A series of sketches based on his youthful exploits around Ballyclare became McIlroy's first book, When Lint was in the Bell (1897). This book's popularity encouraged him to write The Auld Meetin Hoose Green (1898), a humorous re-working of tales told to him by his mother, and by workers in the east Antrim countryside. 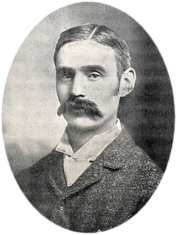 McIlroy uses the true Scotch tongue of the countryfolk in his writing, and publication of his second book in Belfast was followed by an edition in Toronto, with the book selling well on both sides of the Atlantic. Between 1900 and 1910 five more books followed, By Lone Craig-Linnie Burn (1900), A Banker's Love Story (1901), The Humour of Druid's Island (1902), Burnside (1908) and By the Inglee Nook (1910). The popularity of his writing made McIlroy in demand as a lecturer, when he would regale audiences with tales of old Ballyclare. Ill health brought on by extensive work caused him to travel through Europe to recuperate, but he never recovered sufficiently to follow an ambition to become an MP. Instead, in 1912 he travelled to Canada to work for the Presbyterian Church, but his final journey was to be on the RMS Lusitania, which was sunk off the coast of Cork by a German U-boat on May 7th, 1915. One of almost 1200 souls who perished that day, McIlroy never returned to the land of his birth.